The Gay Gamer: So, what do you think of Pokémon X/Y? So, what do you think of Pokémon X/Y? Anyone who's even a smidge interested in Nintendo's Pokémon series woke up to a semi-surprise yesterday (no, not that kind of surprise)--with that surprise being the announcement of a new pair of mainline games known as Pokémon X and Pokémon Y. * Everything in the game--including characters and environments--appears to be rendered using polygons. In other words: so long, sprites, and hello, fully three-dimensional towns, fields and battles. * Three new starters will be made available to folks who decide to pick up and play copies of Pokémon X or Y: Chespin (grass), Fennekin (fire) and Froakie (water). * Two new "legendaries" will make their debut in these titles, too--one of which is some sort of stag and the other of which is a bird. * For the first time ever, these Pokémon games will be released in Australia, Europe, Japan and North America simultaneously (this coming October). Given all of the above, what do I think of this announcement? I'm intrigued, no question. Although I wasn't exactly blown away by the first few seconds of gameplay footage shown during the Nintendo Direct broadcast, once the action switched to the title's battle sequences I was suitably impressed. Speaking of questions: how do all of you feel about Pokémon X and Y? Are you excited about them or not? And are you planning to pick up one version or the other (or even both) upon their release? I'll buy one of them (I'm leaning towards Y), but I'm not as excited by the prospect of a 3DS Pokemon as I thought I'd be. I haven't played the last three releases (Heart/Soul, Black/White, and its sequels), but I still feel a bit burnt out. The 3D (and framerate!) looks a lot like Dragon Quest IX. You know, it *does* look a lot like Dragon Quest IX, lunch--which is kind of weird. I wouldn't say it's an entirely bad thing, though, as that game looked pretty good. Also, I think it's already pretty obvious, even at this early date, that this game is going to push around more polys than that one (just look at the Pokemon during the battle scenes). Anyway, it'll be interesting to see how much either of us plays/enjoys these games. I was really surprised by a tiny detail in the trailer-- all three starters appear to be dual type. You can see them using two attacks each in the trailer, against pokemon who are weak to each attack. Froakie- uses something fight-y against a normal type, is water/fighting. The end result is that each is strong and weak to the other two! In other games, starters develop secondary types in their final form, but they've never had this kind of double type triangle before! A tiny detail, but it signals that the company isn't afraid to shake up the pattern of a "main line pokemon game." I'm excited! Ah, see, I never would have noticed that if you hadn't pointed it out, tone def. Very interesting! It sounds like you're a pretty big Pokemon fan, eh? If so, what do you think about this kind of change to the series' tried-and-true formula? 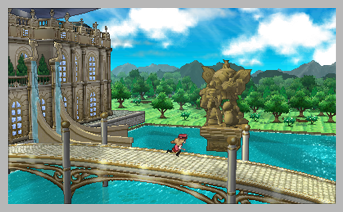 Also, do you like that the game will be fully 3D/polygonal, or do you wish it still used sprites? Everything looks really bland to me; almost as bad as the Game Cube ones. It's a shame they couldn't come up with a more interesting style for it. Still I haven't bought a Pokemon game in probably 10 years, so I'm obviously not the target market. I get my monster collection fix from the Megaten games. Huh. I don't think it looks bland, Steve, but that's OK. Of course, I was expecting them to use the models from the Pokedex 3D app thingy (which I don't much like, TBH), so maybe that's why I rather liked what I saw in yesterday's trailer? Sounds like you wouldn't be picking this up regardless, though? As for enjoying the Megaten games: Yes! I'm guessing you're excited about the release of Soul Hackers and possibly SMT IV in the US this year? The starters look to be dual type, as I see someone mentioned. I think they're maybe grass/ground, because of the mole elements, fire/psychic, because of the pink lines, and water/fighting, because there's some kind of fighting-type move in the clip...that could be pretty great, and could open up more opportunity to tackle gyms in different orders, sort of like MegaMan, if they were to scale the leveling to your level or something...I doubt that will happen, but...maybe. And...I'm gonna get whatever version has the deer legendary and use Chespin. No contest. He's freaking adorable!! Nice to see I'm not the only one detecting maybe a dual-type starter triangle. Sweet! Day One purchase for me. I'll pick up Y, since I always choose the second game in the name because it always feels like the underdog in the message boards. This could be the game that makes me choose something other than a grass starter because Fennekin is adorable. 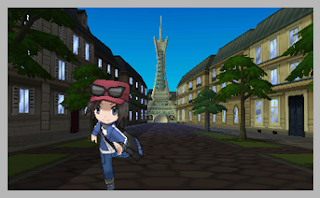 The 3D environments and battles are nice, but the feature I'm most looking forward to using is Street Pass. 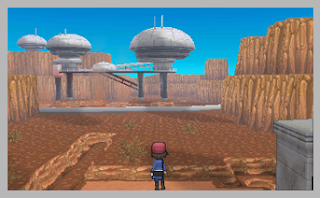 I'd love to see a return of the secret bases from Ruby/Sapphire or just having other trainers appear in my game with their Trainer Cards and party available as NPCs for battle. And of course, I want to capture more Pokemon. I hope transferring from older games is easy; I have 648 Pokemon to move. I only need Meloetta to complete my Pokedex. Oh, I'm glad to hear you're excited about it, too, Justin. And, yes, you're right that some of the areas shown in the trailer looked a bit ... sparse, but like you said, this is pretty early footage. I'm sure the final product will be as packed with charm (in all areas) as the previous titles seem to be. As for your choice of game and starter: I'm guessing Y will have the deer legendary (due to it looking like a Y when you look at it straight-on), but I definitely wouldn't hold me to that, as I'm always confused about which title has which characters/legendaries/towns. Since it started out as a cute 2D heavily pixelated game, I just think they could have done something a little more interesting to pay homage to its roots. Like Paper Mario-style 2D polygons or the 3D pixels in 3D Dot Game Heroes. You know I'm freaking out about Soul Hackers the way every one else is about X & Y. And I will do the same for SMT4 when it gets officially announced. I'm really looking forward to seeing/learning how these games use Street Pass, too, Zaphod65. Nintendo has done a pretty good job of putting Street Pass to good use in its other 3DS titles, so I'm hopeful they'll do the same here. I would've liked it had a Paper Mario-ish art style used in X/Y, actually. Not sure about the 3D pixels idea, though. That said, I think this kind of cartoonish style will work well, too. The battles certainly look good to me, and that's the most important thing, IMO. As excited as I am for Soul Hackers, I'm much more interested in and excited about SMT4. Do you think we'll get it this year? I hope so, although I'm betting we'll have to wait until next year. Oh, well, it's not like there won't be enough 3DS games to play this year, right? It varies from game to game. Diamond & Pearl let you import from GBA after you beat it, and Black & White used PokeTransfer for earlier DS games. Oh, was that the announcement? I kind of figured. -sigh- I thought the announcement was that they were going to go back to the OG pokemon and trash away all those stupid new ones. Not going to lie, I would probably want to play this game since it is in 3D...though, I haven't played pokemon since blue/red on GB. I'm really psyched- I legit got chills during the reveal. I love that they went with a more anime/Dragon Quest/Tales of... visual style rather than a more "CG" (maybe NSMB-esque?) look, if that makes any sense. I'll be getting X because my girlfriend said she really wanted Y (or was it the other way around? ), and I'm really looking forward to buying this digitally- having Pokemon on my 3DS at all times is going to be amazing! Oh, and Froakie as my starter, for sure. I'm sure they'll do that at some point, Tom--or at least give us another remake of Red/Blue. Although maybe not until next gen? I actually like quite a few of the new Pokemon that appeared in Black, White, BTW. Not all of 'em, of course, but then I didn't love all of them in Red/Blue, either. Hey there, Ryan! Yeah, I like the art style, too. After seeing (and being disappointed by) the new Pokemon Mystery Dungeon game that's coming to 3DS, I was worried they'd use that art style in the next mainline game, which would mean I wouldn't be all that interested in it. So glad to find out that won't be the case! Well anything distinctive would help make Pokemon interesting to me. As for SMT IV, I think it's possible we could get it around November, assuming Japan gets it in the Spring. But it wouldn't surprise me if it slips into 2014 for us. Finally new Pokemon. After the disappointing Black/White sequel. I preordered White 2 and I barely played it. Just don't feel the motivation to catch all the Pokemon again! I played Pokemon White about 500 hours and catched all Pokemon. Awww I can't believe they announced it for October! Did you like the first Black/White games, Lizzi? Just curious. I really liked them, but like you I haven't had much interest in picking up Black2/White2. And given that X/Y will be coming out later this year, I'll probably never pick them up now. Oh, well. Yes I loved the first Black/White games. As I said I played my copy of White about 500 hours and catched all 700-something Pokemon. I was a bit disapponted of Black/White 2 and would only recommend it to someone who not already owns one of the first two. It looks so freakin' great. Do you think that "Shin Megami Tensei IV", "Fantasy Life", "Pokemon Mystery Dungeon 3D" and "Bravely Default" will make it to Europe? This game looks absolutely brilliant. I'm going to wait before I decide on which version I want more (to see if there's some significant differences like there was in White/Black), because neither of the two legendaries really matter to me (I've never been a fan of Legendaries on my team, anyway.). That being said, the main character design looks pretty bland, and I didn't get a good look of the girl character in the trailer. I tend to prefer playing as girl characters anyway--it's my weakness! But, the new Fire-type looks awesome. I usually go with Fire-types when I play Pokémon, and the cute little fox thing wins my vote by a gigantic margin. 500 hours, Lizzi? 500?!? I'm ... at a loss for words. (Almost.) Wow. I'm not sure I've ever played a game for 500 hours, although it's possible I've played the original Animal Crossing that much, or Final Fantasy IV and V, etc. Regardless, that's ... amazing! As for Bravely Default, Fantasy Life, Pokemon MD 3D and SMT IV coming making it to Europe: I'm going to say (in order) I hope so (but I'm starting to doubt), no, yes and maybe. SMT IV is a sure bet for North America, I think, but Atlus games are kind of hit and miss in Europe, right? That's why I said SMT IV may be a maybe in your neck of the woods. Yeah, I need to hear more about any differences between the two versions before saying for sure I'll pick up Y or X, Espiga. And, yes, the boy's design isn't the most exciting. I like the glimpse we were given of the girl, though. It seems she has a lot of hair, which always is a good thing in my book. Glad to hear there's another Fennekin fan out there. Of course, I think there are a lot of them out there at the moment, aren't there? Glad to hear I'm not the only one who immediately saw similarities to Dragon Quest IX! I'm pretty sure you already know I'm well excited, Bryan, but in all honesty I'm not as excited as I thought I'd be for a Gen VI announcement. Why is that, I wonder? It may have something to do with the fact that I feel like I literally just played Pokemon Black/White 2 (which is kind of true), and since that felt like the "main" Gen V installment, maybe Gen VI is coming a little too soon for me. Don't get me wrong, I'm really excited for all-new Pokemon designs, so hopefully I'll get over the feeling of "didn't I just play a Pokemon game?" by October! I'm definitely looking forward to see how Game Freak utilizes the StreetPass feature, in particular. Oh, I think your reasoning makes sense, Anne! I have a feeling you'll feel better once October finally rolls around, though, as it is quite a few months away. As for getting X or Y: I want whichever game will have the stag, I think. Oh, and I'll probably wait until I see how cool (or not cool) each starters' evolutions are before choosing one, too. There's nothing worse than picking a starter that begins adorable but winds up hideous, if you ask me! Now that it's been mentioned, Anne, I can't stop thinking about it! Not that I mind at all, but it's just kind of ... interesting. I'll probably try it out when it comes here. I wouldn't mind that, Igor. I'm kind of surprised Nintendo hasn't allowed it up until now, although I'm sure they have their (possibly strange) reasons. That said, I've never minded the pre-made characters they've given us in these games. In my experience with Pokémon, the girl character looks better than the male in every single instance. As for Fennekin, I think part of what I like most about it is that it gives me vibes of Vulpix, which was my favorite Pokémon until Gold/Silver came out and I fell in love with Umbreon. 500 hours? Whew. I usually manage 100-120 per title (200+ for Pearl), but I've never made it that high. I've been unable to get into the competitive breeding/battling aspect that would keep me plugging away that long, although I've been tempted. Does this mean Diamond/Pearl is your favorite, Zaphod65? I was unable to get into that one for some reason, although I've always wanted to go back to it and give it another try. Sorry, Alois. You had to know it was going this way at some point, though, right? Also, I don't think 3D battles have to also mean slow battles. I thought DSIX battles were speedy enough, at least. I loved Dragon Quest IX (that's DSIX yes? :P ) but even that was far too slow for my liking. I'm really picky about this, though. My ideal pace in a RPG battle system is all about minimal animation and rapid read outs. You know that pause at the end of each move in Pokémon when there's a weather effect in play? Drives me insane. Anyway, there's nothing wrong with being picky. You want what you want! Out of curiosity, which RPGs out there offer the kind of fast-paced battles that you're looking for? I'm a little excited, very intrigued but I want to hear more about changed to the usual formula and see more trailers before I decide if it's a day one or something I'll just get at some point. Almost all the Dragon Quests, Final Fantasy 1-6, Suikoden II, Etrian Odyssey. The Tales of series are pretty fast too but also pretty dull :p .
Ah, OK. I definitely agree with you about the first six Final Fantasy games having zippy battles. Etrian Odyssey, too. Strangely, the only Dragon Quest I've played other than IX is/was the first one! Actually, miruki, I think some/many older RPGs had faster battles than the ones that are released today. Anyway, I agree with you both when you say that you'd like battles in Pokemon X/Y to not be too slow. I guess we'll find out if that's the case (or not) in a few months! Depends on the game, I'd say. The older Pokemon games were incredibly slow. FFIX battles have such long battle intro and fighting animations that I always wonder why I keep playing the game... SNES games surely had a lot less animations since back then everything was really limited. Oh, yes, you're right. It definitely depends on the game. That said, I think most NES and SNES games, for instance, have quick battles. Things surely slowed down, though, once the Saturn and PS1 came out. Well, miruki, you're talking to someone who, nearly without exception, thinks the original forms of Pokemon are cuter/better than their evolved forms, so you won't hear any tsk tsk-ing from me in response to your comment about not evolving your Tepig! I really shouldn't be as excited as I am just because it's in 3d, but like, I am. 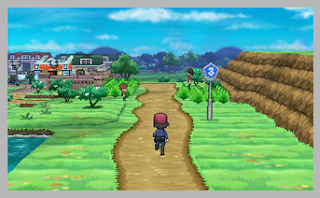 I know its terrible but I was really sick of the graphical presentation of Pokemon games, does it really have to look exactly like it did almost twenty years ago? Looks like I'll be buying a 3ds. I don't think it's terrible, Josef! It's good to want games/series to grow and change over time. If they don't, what's the point in continuing to buy them? That's my opinion, at least. Anyway, I think you'll really enjoy your 3DS. Be sure to check out some of the non-Pokemon games once you get one, as there are a *lot* of great games on this system, in my experience. Hey Mr.Gay Gamer. I'm a frequent reader/commenter person on Anne's quirky little blog and I often see you commenting with some interesting stuff so I thought I'd come here and check you out ;), and sure enough, more interesting stuff here also! So thanks for a great post, I honestly do not know what to think of Pokemon X and Y, I am very much a fan of the traditional 2D Pokemon for the Gameboy Colour. I have barely touched any Pokemon games for a few generations (console generations I mean, I'm not a timelord or anything) but I am slightly intrigued as to how this one will go down with the long time fans! I for one think that it looks quite groovy, can't wait to see how it plays, and yes I will definately give it half a play at least! Hey there, Billy! Nice to see you over here, too :) Anne has a great blog, doesn't she? I'm so glad I've gotten to know her better over the last year or so. Thank you for the kind words about this blog, by the way. I really appreciate them, and I hope I can continue to publish stuff in the coming weeks/months/years that will interest you. As for Pokemon in 2D or 3D: I understand preferring the 2D games. I tend to prefer 2D, sprite-based games myself, as there's always something more charming about them than 3D, polygon-based games. That said, I'm curious to try out Pokemon X/Y. I think Nintendo does a better job than most developers of moving 2D games into 3D, and I have a feeling these games won't be an exception. Anyway, I look forward to hearing what you (and others, too, of course) think of these games after they're finally released. Thanks again for the comment. Hope to see you back here again! I will be sure to check you out frequently, thanks for the speedy response!